Have you discovered that an employee you recently hired isn’t turning out to be as capable as they said they were? If so, you may have been fooled by a fake candidate – a growing scam victimizing IT employers. With IT unemployment at less than two percent, some unscrupulous recruiting firms (usually subcontractors) are presenting candidates who appear highly skilled and experienced on paper, but who don’t actually exist. These firms forge documents and send a surrogate to interviews, only to send other, less skilled individuals to job sites. Although it may be impossible to completely eliminate the problem, BravoTECH has developed a process for detecting fake candidates before they impact our clients. Based on our experience, here are a few of the warning signs and tips for identifying these posers. Too many skill sets on a resume, along with contract work at several Tier 1 firms, can be a red flag. Fake candidates will drastically over-represent themselves to get the attention of recruiters. If a resume looks too good to be true, it probably is. Examine contact information. Fake candidates may only provide an email address or phone number. If there is no permanent address, make a note to investigate further. Check for errors such as more years of experience than would be possible based on the candidate’s graduation year. Review employment applications and visas to make sure dates and years of experience are consistent. Check online profiles to ensure that a candidate’s work history and skills match the resume. If there is no LinkedIn profile, or if the profile contains inconsistent information, be skeptical. If your initial contact with the candidate is a phone interview, follow-up with a Skype or in-person interview so you can see the candidate’s face. During the Skype interview, have the candidate hold a photo ID close to the camera so you can verify their identity. Never allow the candidate to wear ear buds in a Skype interview, since this provides a way for someone off-camera to feed the candidate answers to your questions. Instead of just checking the references listed on the resume, verify past employment by calling the companies’ human resources departments. If a fake candidate goes undetected and is now set to work for your firm, there are still a few things you can do minimize the waste of time and resources. Make sure your recruiter or recruiting firm verifies the candidate’s drivers license number, visa, or other legal forms of identification during the background check. Check the person’s photo ID again, in person. If the candidate’s contact information has changed, ask why. The person may have recently moved or purchased a new phone, but this is also a sign that the person you are now in touch with is not the person you interviewed. If you have suspicions about someone who is already on the job, have an IT or human resources manager conduct an extra “job satisfaction interview.” Explain that it’s a process to ensure that each employees’ skills are matched to the most appropriate roles and projects. Ask for detailed information such as technologies they’ve used, training they completed, projects they worked on, past supervisors’ names and size of the teams they were a part of. This information may have been provided in previous interviews, but if you’re not talking to the same individual, the answers may not match up. Assign technical projects to new IT employees as soon as possible, so you can assess their skills quickly. Assigning mentors to new employees is always a good way to ensure a smooth start, but it can also help you quickly uncover problems, such as a lack of required skills. This scam is a serious, growing problem in our industry. If you’ve been approached by a fake candidate or have additional tips for detecting one, let me know. 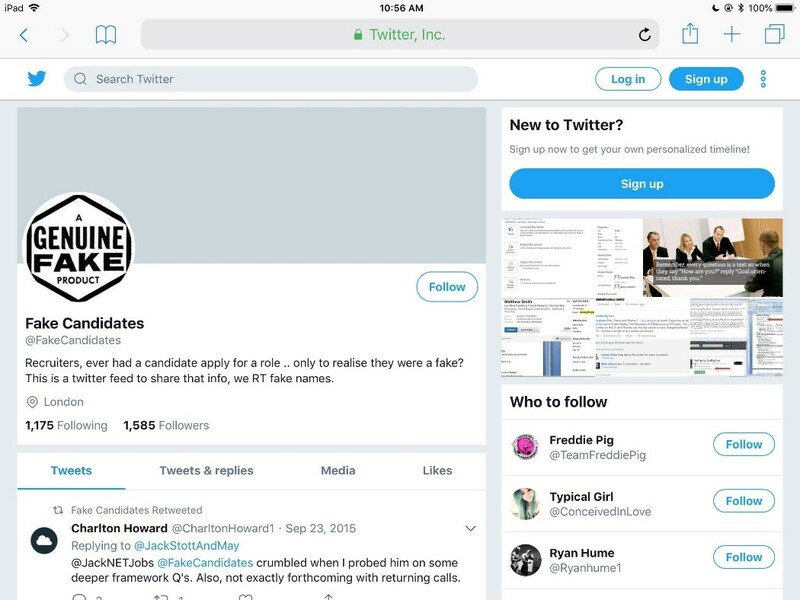 The Twitter account @FakeCandidates was created to expose individuals posing as fake candidates as well as unscrupulous recruiting firms who use them.